I thought February was pretty bad. I thought that maybe with my coursework ending in the middle of March, that somehow things would get better. March was awful. March was worse. I had been given permission to go off of a medication in late February, and it caught up to me in March. I was incredibly depressed all month. Anxiety attacks became a multiple-times-per-day thing. I spent most of my month overwhelmed and feeling like there was no way I was going to ever get anywhere or survive this at all. I barely remember March, if I’m being honest. But I did manage to do all of my rituals, so at least there is that? I remember the day, because I wrote notes about it in my bullet journal. But I don’t really recall the ritual. I know that I did the same rubric from January, and I don’t think I included the “Becoming Ma’at” section this month. 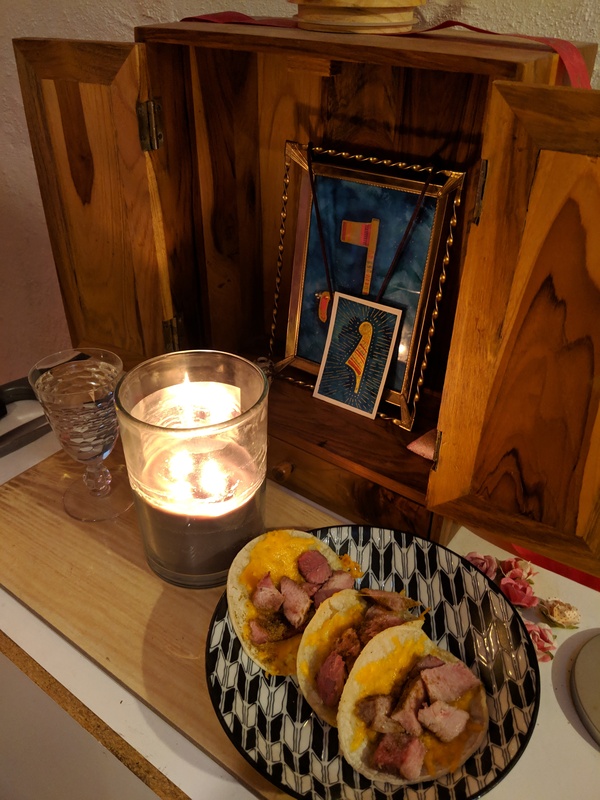 Luckily I had food on hand, so the offerings were pretty solid. But the day was garbage. The akhu rites followed the day after my Monthly Ma’at rites, which made the akhu rites suffer. 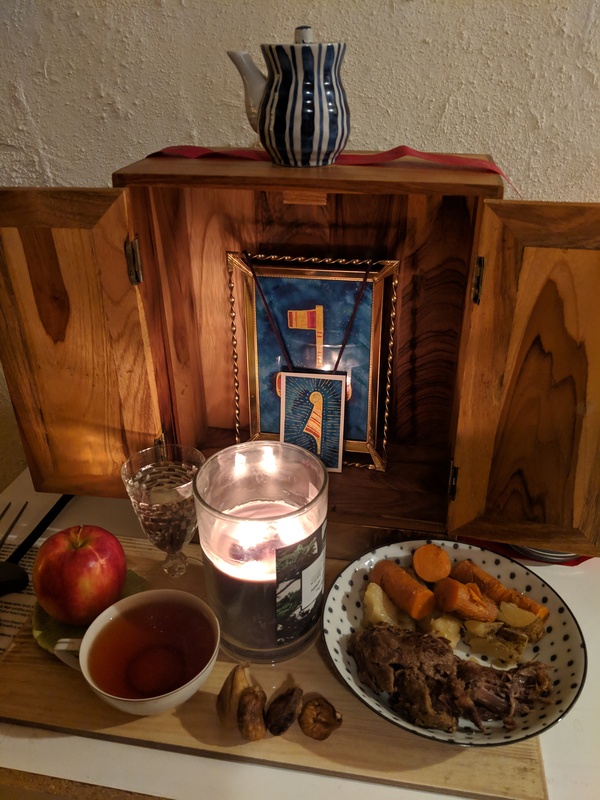 I was hungry and really wanted to hurry up and eat, and so I forgot to take pictures again, and so I don’t have anything to even show for the ritual. I don’t have any commentary, either, other than I did the same rubric from the previous two months. The icon that I’ve been using for my propitiation rites has been slowly shifting each month. I got the inclination to add gold elements to the leaves and the forehead. I also added green elements to the ma’at feather and to the general background. We’ll see if I get another memo to update the icon for next month. 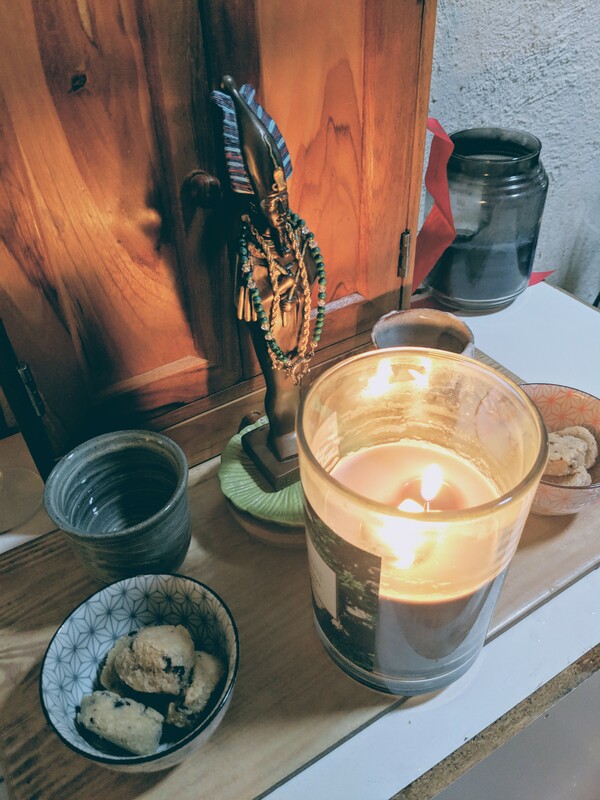 For this month’s propitiation, I decided to try something called “vooing.” I learned about it while at my PDC and decided to look into it on my own time because, honestly, I needed any edge I could get this month. The “Voo Breath” is a modality that is often used in somatic therapies, and is basically a sort of gentle “massage” for your viscera, or so I’ve seen it described. It’s a lot like chanting, and it seems to help calm the Vagus nerve, which is largely responsible for our anxiety responses in life. It can look a bit like this. Ironically, I had the inclination to do something similar to this from day one, but I could never bring myself to do it (probably due to anxiety, unsurprisingly.) However, I guess finding out that it’s a “legit thing” caused me to reconsider whether it was worth trying. And I guess I got desperate enough or felt safe enough to do it, and so I decided to give it a go for my propitiation this month. I figured if it helps calm me down and help me center myself, perhaps it would work for the Iyrt Ra… right? I personally enjoyed the experience, but I can’t comment on whether the NTRW are for it or not. 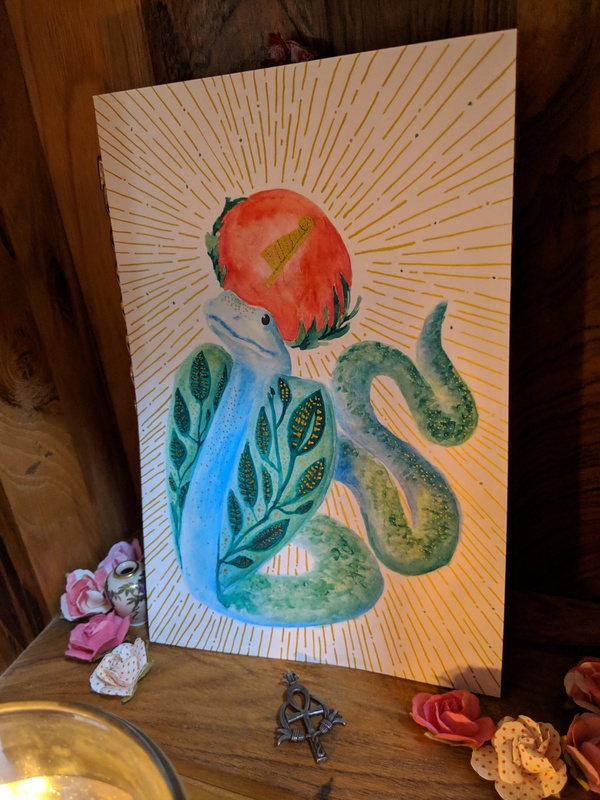 I also made a heka art piece that I offered as well, which you can see in the image above. Also, yes, more tacos. By the time my execration rolled around, I actually started to feel marginally better. 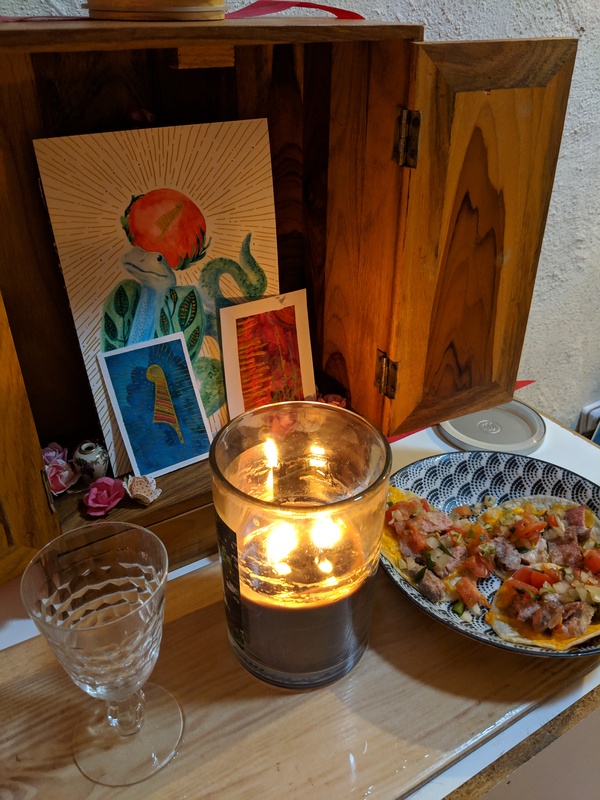 I had a shift somewhere in between both of these rituals about my situation, and somehow I was somewhat more back in the game, but only by the tiniest bit. The bit was so tiny that I basically put off doing my execration until the very end of the day. Why? I don’t know. It just seemed like I had no idea what to do or what I was doing, and so I put it off. I also had the urge to make a second ma’at feather in silver to complement the gold feather I had already made. That also debuted with the execration. This was another example of my wanting to do a ritual, but life got in the way. The Sunday that this rite fell on was way too hectic, and so I then planned to do it the day after, April 1, instead. But then I ended up having to take grandpa to the hospital that morning, and most of my day was eaten up dealing with all of that. 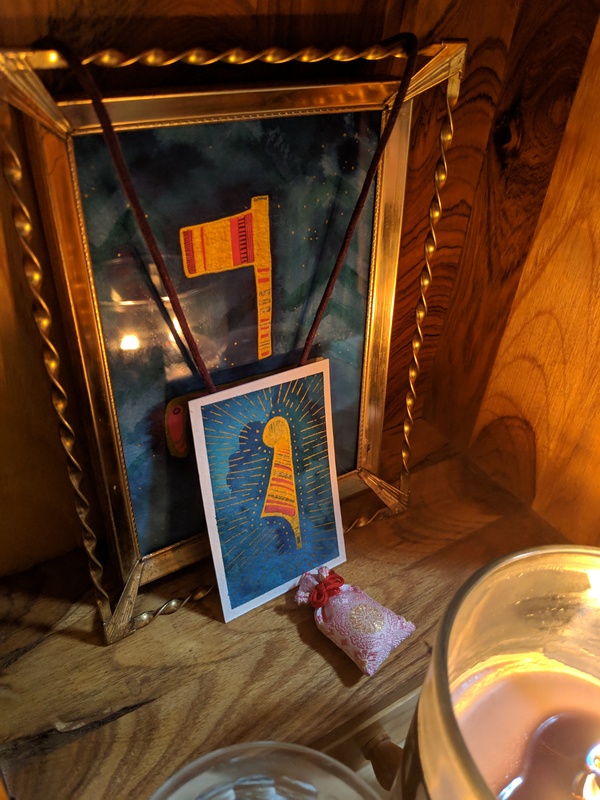 I had wanted to shift my focus of this ritual to be more about thanking Wpwt for the things that people have told me have manifested with their petitions they sent in. Originally, I wanted to give him a big meal and everything. And so I ended up just throwing together what I could find (lol candy) and hoping that it wouldn’t count against me too much. I realized when I was at the “cleanse the altar” part of my ritual, that I forgot to dust first, and so I ended up making a nice wet pile of dirt on the altar space — not my most ideal setup. 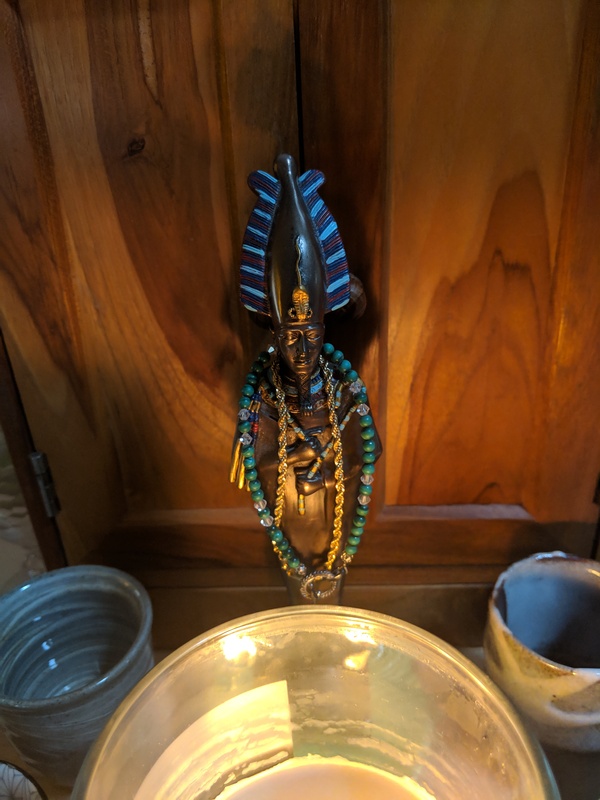 You’ll note in the image above that the shrine space is different, and that’s because I felt more inclined to do the ritual where his statue “lives”, which is in front of Aset and my ma’at feathers. I spent a fair amount of time doing some of the voo breath for him to make up for the lack of offerings. And I can’t really figure out why, but it feels like I’m giving of myself when I do it, and so I may start to add this to all of my rites moving forward. I’m hoping that I can actually give him a proper set off offerings next month to make up for this month’s lackluster-ness. This month was a mess. I was a mess. I am a mess. But despite all of that, I was able to still get my rites done. Albeit, not in the more graceful manner that I would have preferred. But again, its important that we do what we can, even if it’s not perfect. And if nothing else, I have yet to miss a rite, although my track record for meeting my own expectations is still pretty bad. I am hoping to write new rubrics in April, in time to be used for May. So I guess we’ll see what next month brings. So when I first started this challenge I was thinking that I’d do a post after every rite but I realized pretty quickly that I can only say so much before its redundant so I decided that I’m going to start doing monthly recaps unless a rite is particularly involved or has a lot of commentary attached to it. Satsekhem mentioned that she had a holiday for Geb pop up on her calendar, and made a rite for people to follow if they wanted to participate. It was last minute, but I knew I wanted to try and fit it in because I’m a try-hard, and so I worked to try and get everything done in preparation for it. I had been working for the better part of a day trying to get everything written down and all of the offerings in order, and I was about ready to get started when I had a funny image of Geb enter my mind, and I knew I needed to draw him an icon before I started. This brings me to the fact that it feels weird to do rituals to specific NTR with the generalized “NTRW” icon that I’ve got going. In some cases, when I am struck with the “inspiration”, I may start to make flat icons to use for rituals moving forward. Thereby adding another offering to the offering pile. Plus it means I’ll have an icon for the next time I want to honor them through ritual. The rite went off without a hitch and there was nothing else of note that happened. 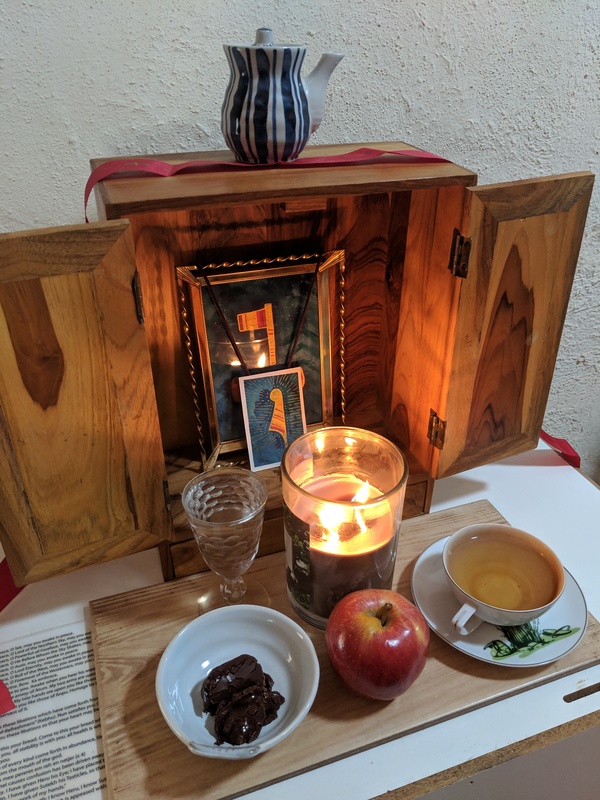 I had learned from my previous weeks and decided to actually get a fair amount of offerings for this ritual. 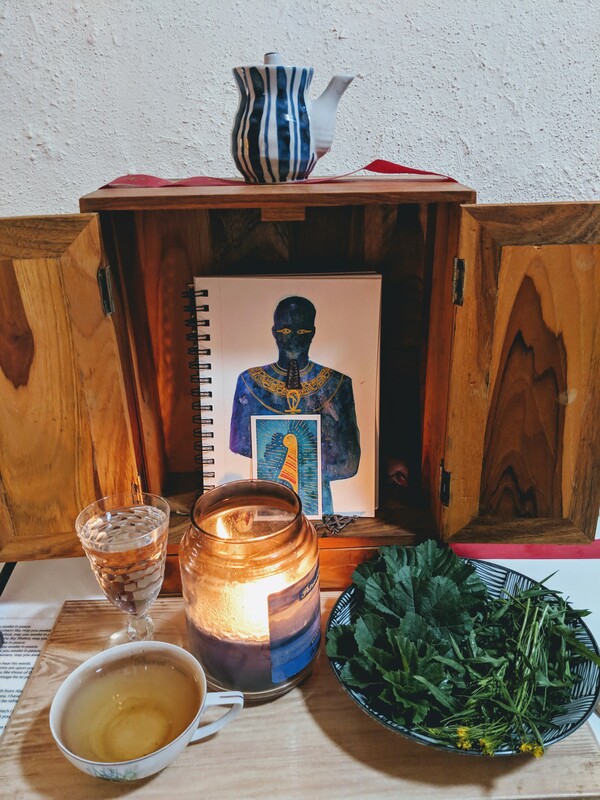 Because the propitiation of Sekhmet seems to heavily rely on offerings, I felt it made sense to put more effort into the offerings for this situation. This was the rite that felt the weirdest for the lack of proper icon. I had attempted to make one, but I didn’t like how it came out when I painted it, so I need to remake it. I had originally wanted to dance for her and play music and stuff, but life got in the way and I could only read the rubric and call it a day. Hopefully next month I will be able to add in all of the other elements for a more rounded rite. 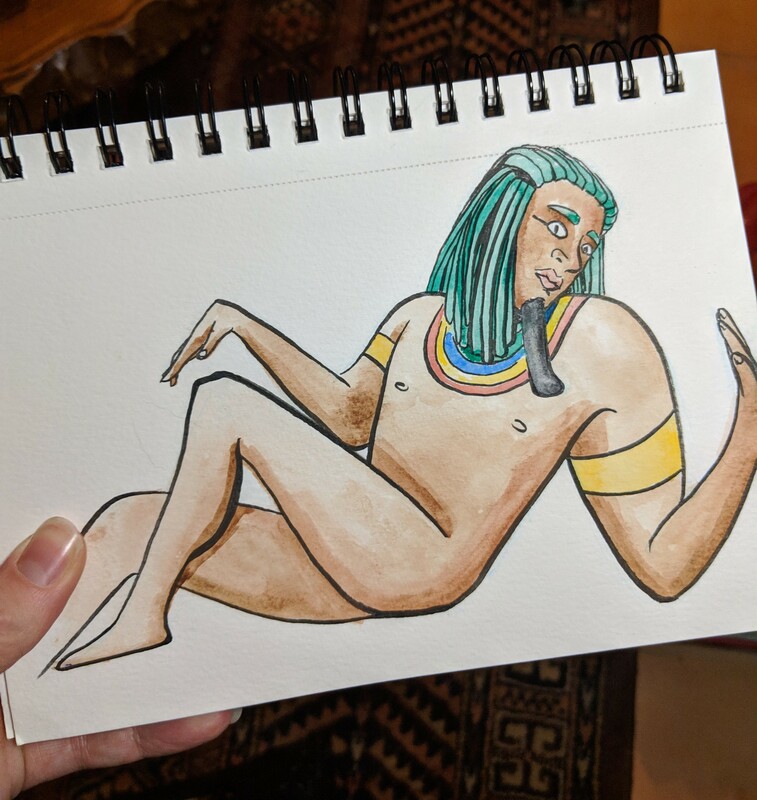 Then Sat talked about this week-long festival for Ptah and, of course, I had to jump on board with it. 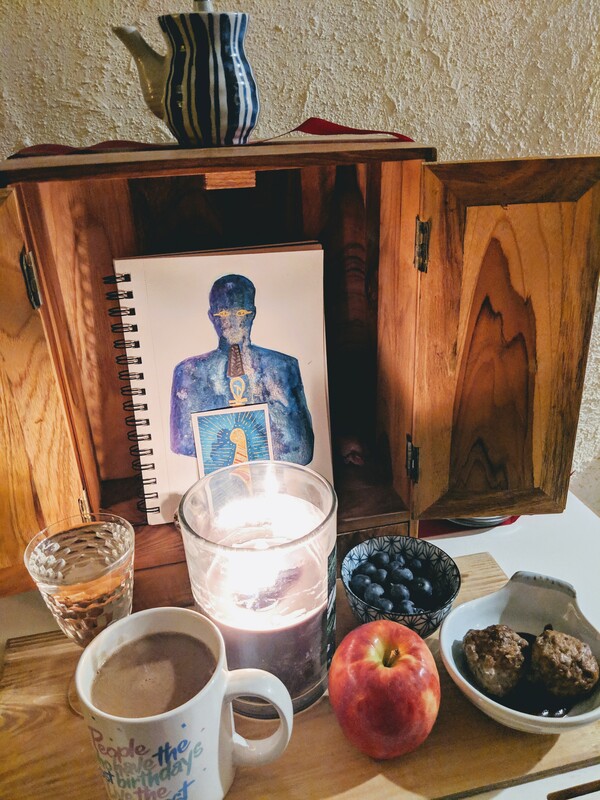 Performing this ritual day after day really cemented for me that I could be more consistent with rituals at this stage in my life, and that I don’t mind doing them regularly. 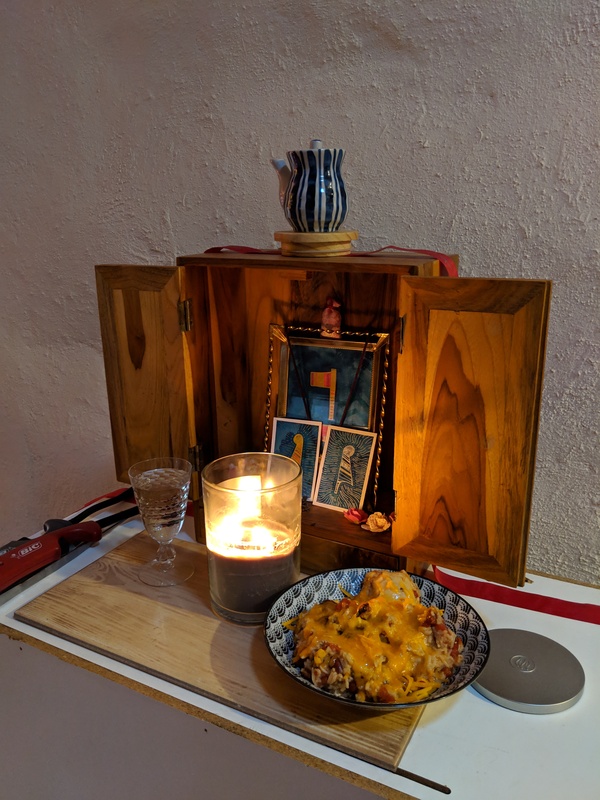 All in all, I’ve been feeling the urge to do rituals every day, and after doing this daily for a week (with the exception of the rite on Sunday, the 27th, because life got too busy and I had nothing to offer by the time I got home,) it feels really weird not to do something at the shrine every day. I also attempted to make an icon for Ptah, but I hate it. I tried to make a different image, but I disliked that one more, so I returned to the original icon and fussed with it to see if it would ever come around to a state that I prefer, and it has yet to. For whatever reason, I found myself having the urge to offer Ptah fresh greens from outside, so I did spend a fair amount of days offering him London Rock and Mallow, since both are in full force outside right now. I messed up my potassium in the process, but yolo or something, right? But then I did it anyways. 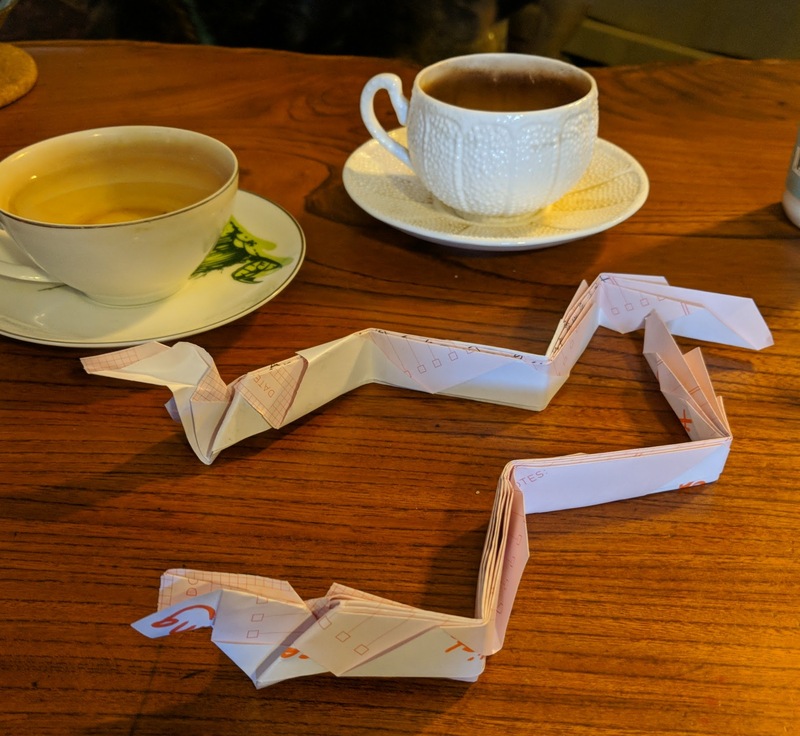 Petitions were written the morning of the ritual and I folded them into snakes because I had no idea what else to do. I wasn’t even sure how I was going to destroy these things up until I just up and did it. I wasn’t sure if I wanted to take them outside to set them on fire (ideal, because I didn’t want smoke in my room) or if I should put them in my brass urn and burn them elsewhere. 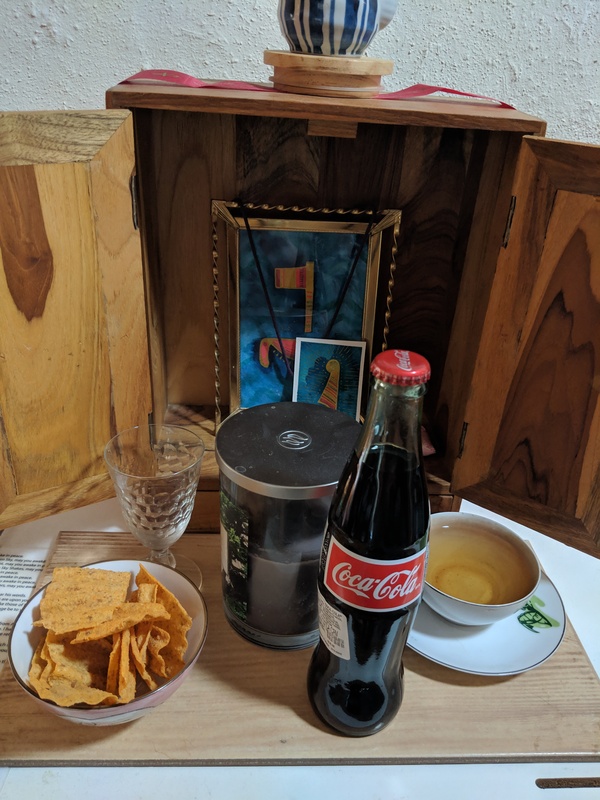 I didn’t know if I should put the petitions on the shrine’s offering “table”, if I should open the shrine before starting or leave it closed, or whether I should do the initial execration away from the “holy space” that is the shrine. I started without really having any of these specifics figured out, and it showed. 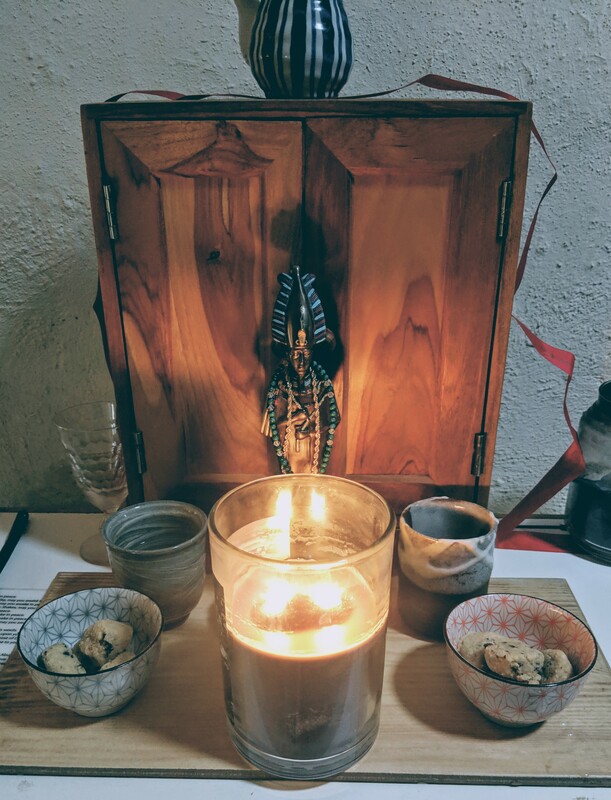 I opted to just do my basic ritual at the shrine, because I didn’t know where else to do it, and I decided halfway through my rite that I would use my brass urn instead of flushing it or just leaving it in the compost bin, etc. So I had to pause in the middle of my rite and un-bury the urn and clean it out just to use it. And then I just…. opted to just burn it in my room because I’m antisocial and didn’t want to deal with an audience if I decided to burn things in a more public space. And so my room smelled of smoke for days. I was really looking forward to this rite, but it ended up not panning out as well as I had wanted. 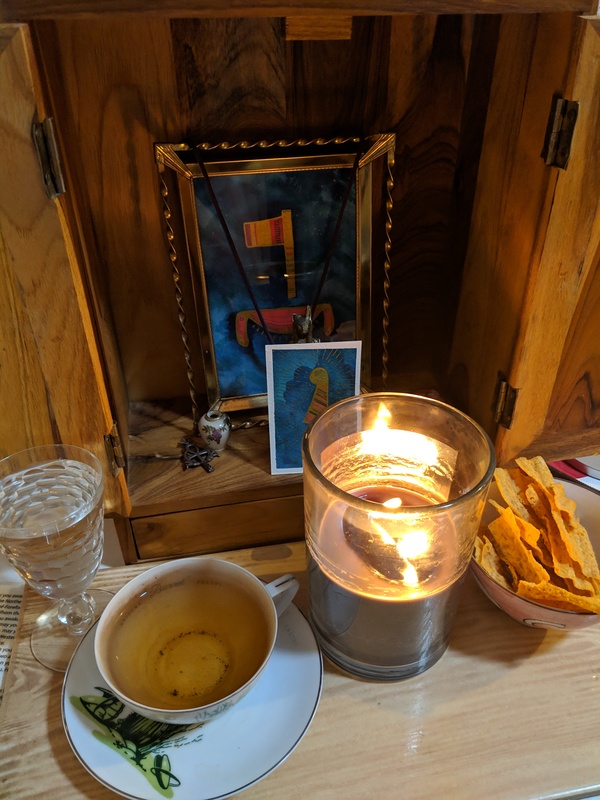 My schedule this week has been completely upended several ways, and so I didn’t prep for this ritual as much as I would have hoped. But it still went smoothly and I was able to give Wpwt several petitions to listen to. I can only hope my weak offering game won’t be a problem. I have a very old icon that was given to me by someone. It was originally for Anup, but I’ve always associated it with Wpwt, so I opted to use that, since I wasn’t having an inspiration about any art. And while I feel like Wpwt was listening, he never said anything that I could catch, so I have very little to report on that front. Akhu: The same rite will be performed as January, with additional parts that are specifically tailored to my grandmother. Propitiation: Same rite as January. Execration: I need to make a new rite that doesn’t include Ptah, technically. More to come on this front. May you awake in peace. The beauty of your face glitters when you rise. O come in peace. One is drunk at your beautiful face, O Sekhmet, come in peace. in the hair of Ra, in the hair of Ra. Do not repulse me upon your path, O Sekhmet. and you two uraei have enclosed me. In order that I may sate your thirst and ease you into a state of Greenness. Great is your majesty when you are propitiated. Everything that you see is yours, so long as Ra crosses the sky. Everything that you see is yours, so long as Geb takes root in the earth. There is no god who does what you dislike when you appear in peace and glory. to make beautiful jubilation for my goddess. I give you essential water, O Sekhmet, a tide in your time. This libation is for you, O Sekhmet, come drink it. I give you this daily joy; It drives away the evil in your heart. I give you drunkenness without unpleasantness; It gives brilliance to your ka. the uraeus of Ra, the protector of all gods. the pieces of your enemies are on the flame. You inhale their aroma. The haunches dissipate your violence. The entire retinue of the NTRW rejoices over their fat. Take the food and provisions for your subsistence. To bring you the bounty of their hearts. As my lips repeat pure Ihy-music for you, O Lady of Eternity. As you see the skipping, O Devourer. Turn about and see that there is no darkness in my chest. So that your face becomes green. As green as a living reed. Ma’at has come so that she may be with you. May your contentment with her wash over you. So I didn’t have much go on with either of this weeks rites, and so I decided to just throw both of them into one post. Honestly, the biggest piece of work that I put into this month’s Monthly Ma’at was the creation of the ma’at card that I will be using in probably every Monthly Ma’at rite moving forward. 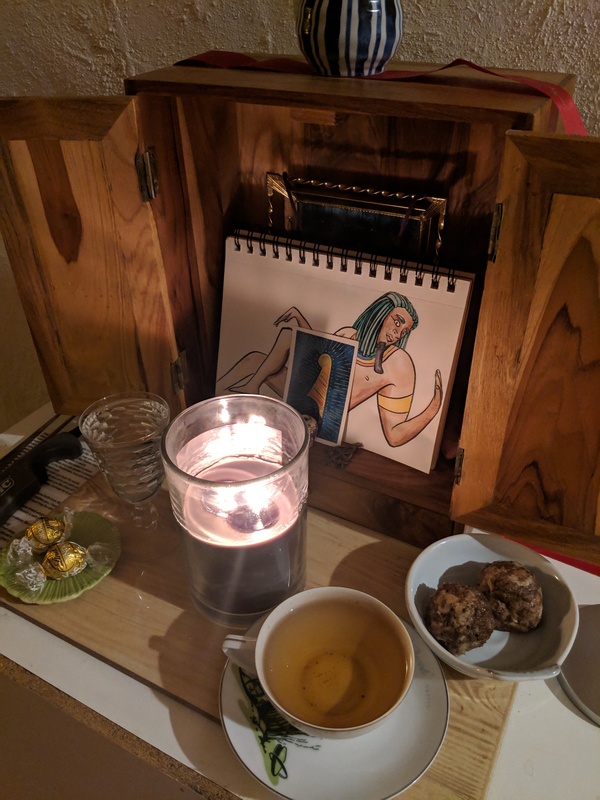 I based it off of the NTRW picture that I made for this year’s shrine, and I think it turned out alright. I definitely slacked off with all of the other offerings, though. 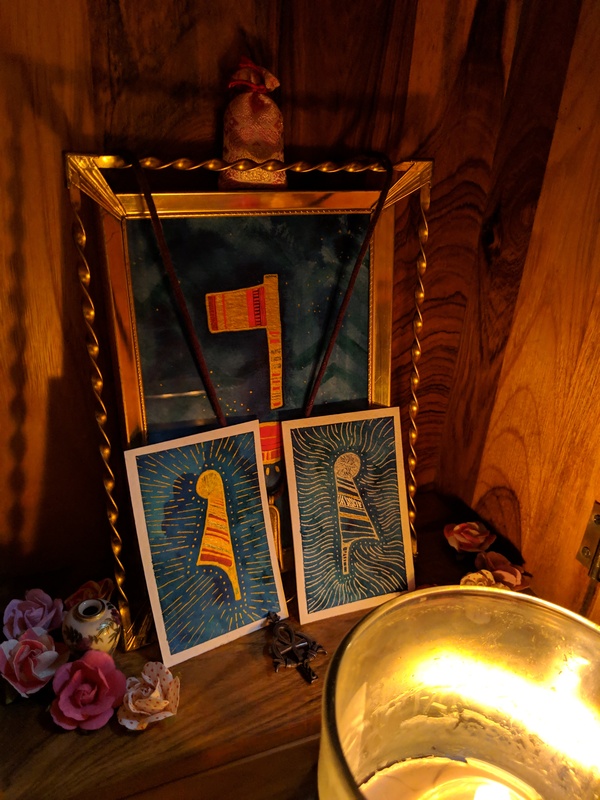 If there was a consistent theme going through this week’s rites its that I need to make sure I’m planning out offerings when I planning out my rubrics. For both rites I found myself thinking that I could totally throw something together from what was in the kitchen, and both times I was disappointed with what I found. So moving forward, I need to plan my offerings a bit more thoroughly. This rite went fairly smoothly for me. I found that I felt like I was doing something over on the astral when performing it here, but nothing too earth shattering or exciting to report overall. 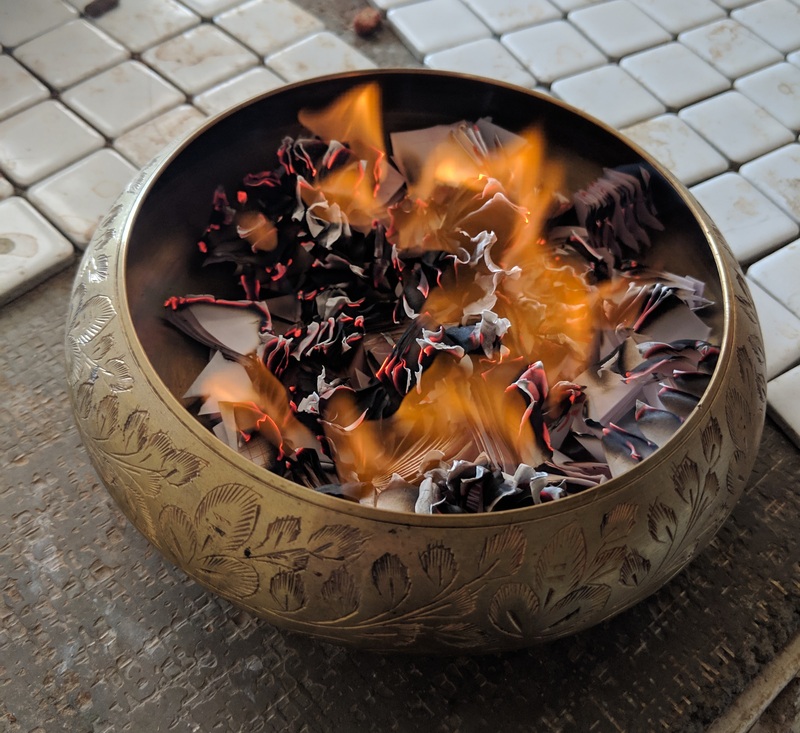 I have found that some people find my rites long, and then I went and made the akhu ritual, which is by far the longest rite I’ve concocted so far (yeah, it’s technically longer than the new years rubric.) I felt a little bad, but I found a copy of the Pyramid Texts laying around in my documents, and found it to be a treasure trove of lines to use for this specific set of rites, and I kinda got carried away. Though if it makes anyone feel better, I have to write each of these rites down before performing them, so I’m really only punishing myself when I make things long. 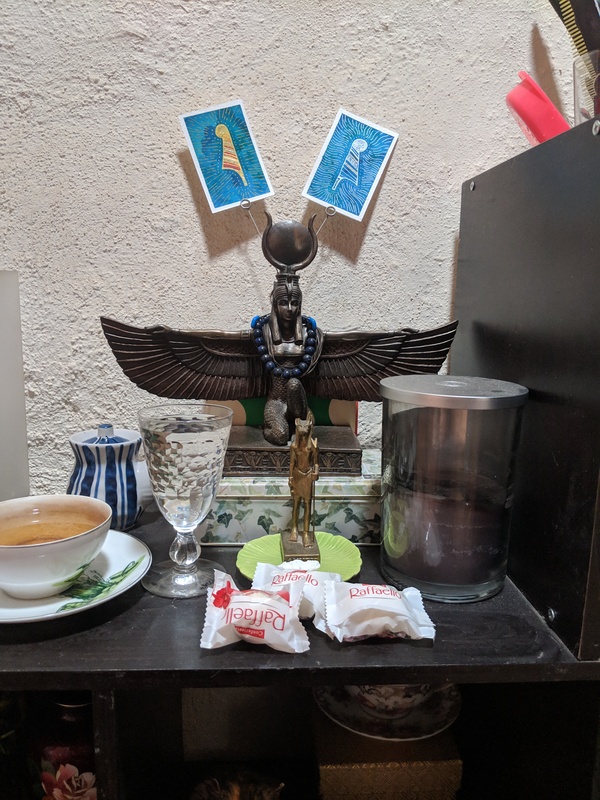 Like with the Monthly Ma’at, I failed to properly source out offerings for this, and I ended up having to go to the store specifically to get something of comparable size/value to use for this ritual. I found out when I went to eat them that they weren’t that good, but an effort was made. And thus concludes week 2. Next week is the propitiation, so let’s hope I do a better job nailing down offerings for that.